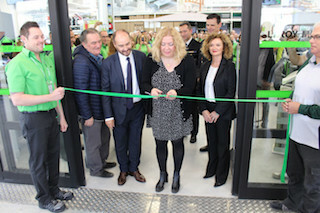 Leroy Merlin opened its new outlet in Motril yesterday, with the Mayor, Flor Almón, cutting the inauguration ribbon. The company has invested 1.2m euros in converting the old AKI store to its new layout under the name: Compact. The store has a total of 55 staff, most of whom live in Motril or in the surrounding area. It was back on the 1st of January this year that Leroy Merlin and AKI merged; a processes that should be completed next year. The store covers 3,000 sq/m where around 12,000 items will make up the stock. It’s opening time is from 09.00h to 22.00h, Monday to Saturday. This entry was posted on Friday, April 12th, 2019 at 8:29 am	and is filed under Motril. You can follow any responses to this entry through the RSS 2.0 feed.